This unique pendant is exclusively carved for Jakobsweg [Bewahrer]. 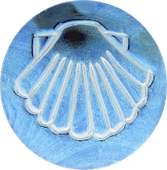 The guide from the Way of St. James is displayed - the stylized scallop. With the supplied, waxed cotton string, the pendant can, for example, be used as a necklace but also as a pendant for your backpack. The neck size can be adjusted with infinitely variable, slidable knots. The pendant is made from buffalo bones. Slight differences in form and color are desired and are a sign of being made by hand!